(Phys.org) —As more gardeners and farmers add ground charcoal, or biochar, to soil to both boost crop yields and counter global climate change, a new study by researchers at Rice University and Colorado College could help settle the debate about one of biochar's biggest benefits—the seemingly contradictory ability to make clay soils drain faster and sandy soils drain slower. The study, available online this week in the journal PLOS ONE, offers the first detailed explanation for the hydrological mystery. "Understanding the controls on water movement through biochar-amended soils is critical to explaining other frequently reported benefits of biochar, such as nutrient retention, carbon sequestration and reduced greenhouse gas emissions," said lead author Rebecca Barnes, an assistant professor of environmental science at Colorado College, who began the research while serving as a postdoctoral research associate at Rice. Biochar can be produced from waste wood, manure or leaves, and its popularity among do-it-yourselfers and gardening buffs took off after archaeological studies found that biochar added to soils in the Amazon more than 1,000 years ago was still improving the water- and nutrient-holding abilities of those poor soils today. Studies over the past decade have found that biochar soil amendments can either increase or decrease the amount of water that soil holds, but it has been tough for experts to explain why this occurs, due partly to conflicting results from many different field tests. In the new study, biogeochemists at Rice conducted side-by-side tests of the water-holding ability of three soil types—sand, clay and topsoil—both with and without added biochar. The biochar used in the experiments, which was derived from Texas mesquite wood, was prepared to exacting standards in the lab of Rice geochemist Caroline Masiello, a study co-author, to ensure comparable results across soil types. "Not all biochar is created equal, and one of the important lessons of recent studies is that the hydrological properties of biochar can vary widely, depending on the temperature and time in the reactor," Masiello said. "It's important to use the right recipe for the biochar that you want to make, and the differences can be subtle. For scientific studies, it is critical to make sure you're comparing apples to apples." Barnes said the team chose to make its comparison with simple, relatively homogenous soil materials to compare results to established hydrologic models that relate water flow to a soil's physical properties, like bulk density and porosity. "This is what helped us explain the seeming disconnect that people have noted when amending soils with biochar," she said. "Biochar is light and highly porous. When biochar is added to clay, it makes the soil less dense and it increases hydraulic conductivity, which makes intuitive sense. 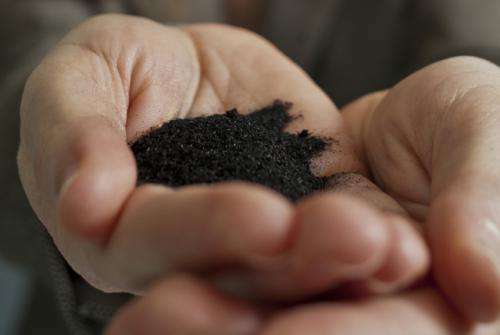 Adding biochar to sand also makes it less dense, so one would expect that soil to drain more quickly as well; but in fact, researchers have found that biochar-amended sand holds water longer." Study co-author Brandon Dugan, assistant professor of Earth science at Rice, said, "We hypothesize that this is likely due to the presence of two flow paths for water through soil-biochar mixtures. One pathway is between the soil and biochar grains, and a second pathway is water moving through the biochar itself." Barnes said the highly porous structure of biochar makes each of these pathways more torturous than the pathway that water would take through sand alone. Moreover, the surface chemistry of biochar—both on external surfaces and inside pores—is likely to promote absorption and further slow the movement of water. "By adding our results to the growing body of literature, we show that when biochar is added to sand or other coarse-grained soils, there is a simultaneous decrease in bulk density and hydraulic conductivity, as opposed to the expected result of decreased bulk density correlated with increased hydraulic conductivity that has been observed for other soil types," Barnes said. The study is the latest from Rice's interdisciplinary Biochar Research Group, which formed in the wake of Hurricane Ike in 2008 when the city of Houston called for ideas about how to get rid of an estimated 5.6 million cubic yards of fallen trees, broken branches and dead greenery left behind by the storm. The Rice Biochar Group won the $10,000 grand prize in the city's "Recycle Ike" contest and used the money to jump-start a wide-ranging research program that has since received support from the National Science Foundation, the Department of Energy, Rice's Faculty Initiative Fund, Rice's Shell Center for Sustainability and Rice's Institute of Bioscience and Bioengineering. Study co-authors include co-first author Morgan Gallagher, a former Rice graduate student who is now a postdoctoral researcher at Rice and an associate in research at Duke University's Center for Global Change, and Rice graduate student Zuolin Liu. What this study doesn't touch is Water Use Efficiency by plants with Biochar amendments. Which for true value must be factored in with Water Holding Capacity.